Perfect iPad add-on for the holiday season, or what? Product Round-Up Steve Jobs famously said of tablets: ‘If you see a stylus, they blew it.’ Any digital artist handed an iPad, however, will start looking for the stylus, as will anyone who wants to scribble quick diagrams. And thus an after-market was born. Indeed, more so for iOS than Android, if the choices beyond the cheapest offerings are anything to go by. Your basic tablet pen consists of a bit of rubbery plastic on the end of a stick, which may be got up to look like a pencil (AluPen), felt marker (Scribbly), crayon (Cosmonaut) or biro (generic styluses available from about 50p). No extra electronics required: the touchscreen just reads it as a finger. Then came smart styluses, with pressure sensitivity to let you modulate line thickness, opacity, splotchiness or whatever as you draw. These contain battery-powered electronics that generate a controlled electrical field. 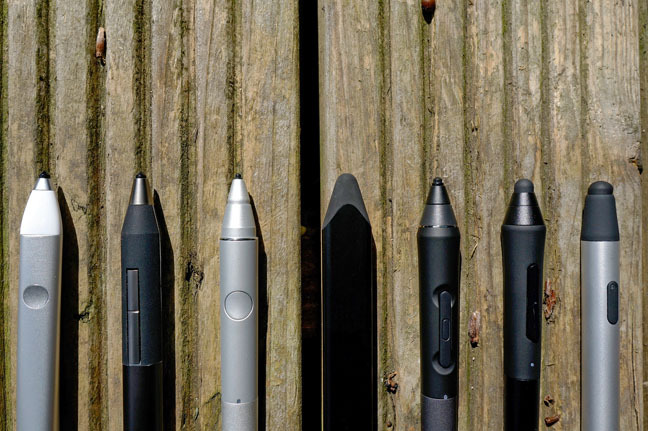 I tried the original, Ten One’s Pogo Sketch, and five other leading contenders, from Adobe, Adonit and Wacom, plus a slightly different option, FiftyThree’s Pencil. What’s more, despite the best of intentions, the developers are only supporting iOS at the moment, so the iPad is the order of the day for this round-up. Styluses connect to individual apps, rather than pairing with your iPad via iOS, so you need to check compatibility. ArtRage is unusual in requiring you to select your model in its tab of Settings. In most cases you connect the stylus within the app. Each pen has one or two buttons, which are assigned to functions in each app, typically Undo and Redo. Adobe’s various iOS apps support its own Ink stylus and the similar Adonit Jot Touch Pixelpoint, plus Wacom’s pens and the Pencil. Tap the pen icon with your finger, touch the pen to the screen, and it’s recognised and ready to draw. FiftyThree’s Paper app, Wacom’s Bamboo Paper and Adonit’s Forge support their makers’ own styluses alone. Like Bamboo Paper, many stylus-compatible apps are aimed at note-taking rather than art. In June, Adonit is launching the Jot Script 2, with an even finer version of its Pixelpoint tip, branded as a companion to the popular Evernote ‘digital workspace’. 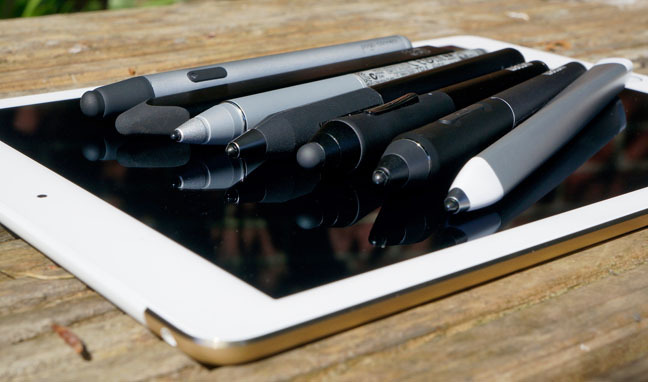 Third-party drawing apps vary in their stylus support. For example, Procreate works with the Adonit, recognising Adobe’s Ink as a variant of it; the Pencil; the Pogo Connect; the Hex3 Jala (not tested); and with the original Wacom Creative Stylus. I found the Creative Stylus 2 and Bamboo Stylus Fineline were accepted as ‘Unsupported Stylus’, but palm rejection (to ignore your hand resting on the screen) was disabled and pressure sensitivity seemed limited. Wacom is the leading brand in graphics tablets, the essential tool of professional illustrators and retouchers – but it’s important to appreciate that their high precision and expressive control is achieved by electronics both in the stylus and the tablet itself. The iPad’s screen wasn’t designed for this, and all of the styluses that work with it are relatively primitive. How do you like your nibs? Hard or soft? The biggest differences are between big and soft nibs and those that are small and hard. This affects accuracy much less than you’d think, but squishy nibs provide a little more tactile feedback, especially for heavier strokes, while fine nibs leave you a clearer view of your exact position on the ‘paper’. 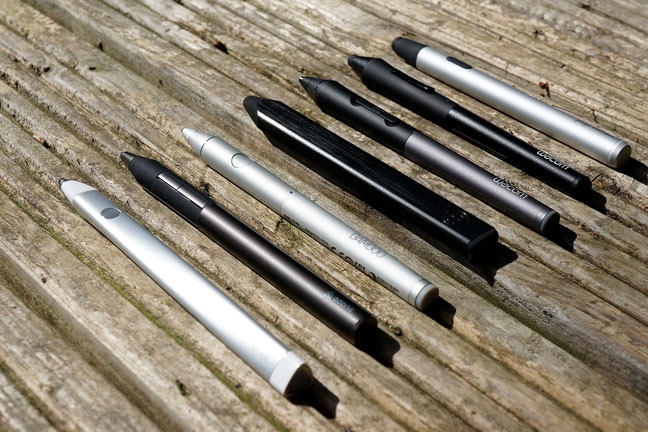 Because these styluses connect via Bluetooth 4, with its low-energy mode, they require an iPad 3 or higher. There’s no obvious reason why they couldn’t work with non-Apple devices, but at the moment iOS-only is the norm.